This stunning pre owned Rolex Pearlmaster with 29mm watch case and masterpiece bracelet are 18ct rose gold whilst the dial is the black mother of pearl with diamond hour markers. 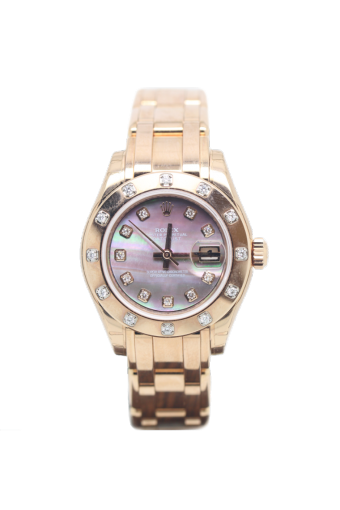 The watch case is 18ct rose gold watch bezel is set with twelve diamonds. Cheshire Watch Company are supplying this watch complete with all boxes and Paperwork which is dated 2017 and the watch is still unworn and factory sealed.